Back in the late 1990s, the prediction was very unstable year to year. However, by the 2000s it had settled into the early 2020s, and as more data has come in, the prediction has actually been coming down slightly to its present 2017 (with the caveat that we have 2012 still to come in September). When the blue curve hits the black curve, then it's over. You can see that commenter Stephen B's instinct that this could even be before 2015 is not crazy - though it's hardly a near-certainty. Finally, the data quality is probably worth a post of its own at some point. In the meantime you can see Piomas's own discussion of their uncertainties here (also see this RealClimate post). There certainly is some uncertainty, but they believe their trend is likely conservative and in any case the uncertainty is not large enough to change the qualitative picture of a fully watery north pole in late summer pretty soon. It would be interesting to turn it around -- how much open water is there to freeze each winter? "Normal" winter looks like 6 M km^2, recent winters look like 8, we might be looking at 10 this winter (this is very rough eye-balled math). A lot more heat is dumped out of freezing open water than is dumped out of freezing ice onto the bottom of an existing pack. What's that going to do to the weather? Presumably THAT is not in most of the older weather models, since they didn't predict that we'd be in this situation in the first place. 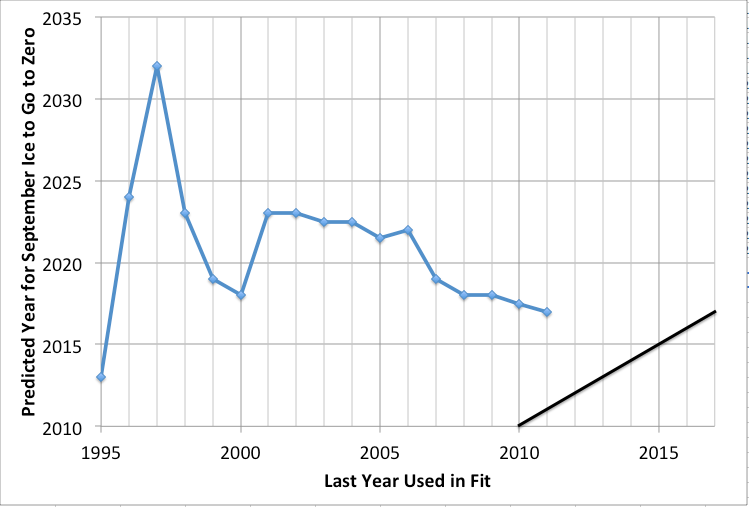 What I find most fascinating is that this trend is so closely tied to empirical observation... I have often commented on your blog about the dangers of putting too much faith in theoretical models. That climate models have failed in their predictions shouldn't be all that surprising - there is too much second order uncertainty in such a complex system. While I think it is wise to not rule out a turn around yet, I wonder if the recovery that you mentioned in the 80s would have been possible if ice volume was as low as we observe it to be today? Sticking with empirical observation, it is worth noting that there appears to be positive feedbacks at play that may not have been present (or at least present but not having the same relative strength) in the 80s when volume/area/extent were much higher than today. For example, recent observations of increased methane off-gassing from shallow waters, or the "arcticane" that I described earlier - both of which appear to be a second order consequences of reduced ice cover. 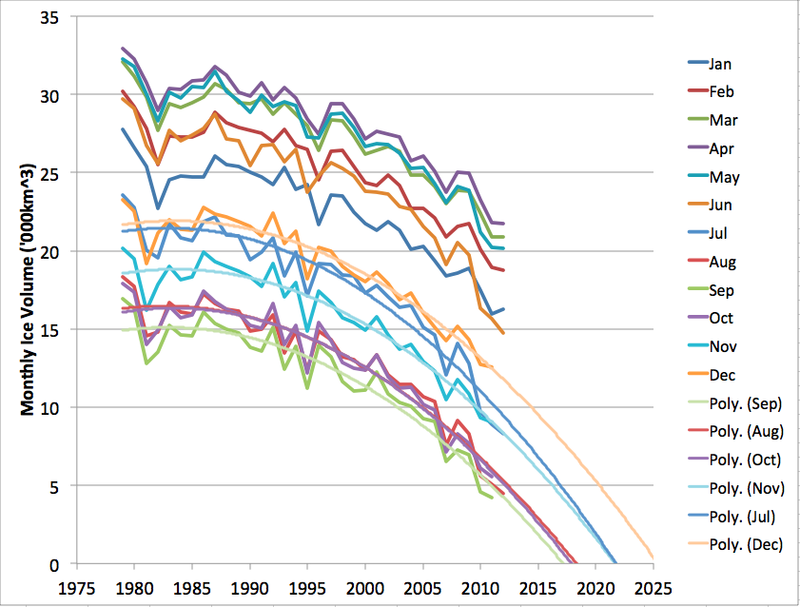 The result shows better the accelerating nature of the sea ice dilemma. I think it is worth to check the energy involved to phase shift all the ice every year. To turn ice into water you need same energy as to heat water by 80°C. Now add day round insolation in Summer to this and you are welcome to the Arctic Vapor Bath. The melting season is getting longer, maximum occurs later, SSA are raising every year and extent + volume are on decline. Is there any reason left to think this process will show linear behavior? What these graphs show me is Arctic will be ice free in a few hundred weeks and not in a hundred years as models still estimate. The only question left is when is the right time to press the alarm button? Regarding 2015, I would say that I wasn't predicting such an early ice out, only saying that it isn't out of the realm of possibility. Another thing to watch, as we go through Septembers with little, and then eventually no ice cover, is how rapidly the re-freeze occurs in the fall. One thing I used to notice watching NH's Lake Winnipesaukee freeze every winter is that it took relatively calm conditions for it to do so. Any wind mixed the surface layers enough, bringing somewhat warmer water to the surface, delaying freezing. But once a think layer of ice did form, a cold wind blowing over the ice could rapidly build up ice thickness to a foot or more inside a week if the air above were cold enough and the wind strong enough. Now, let's be careful here. Comparing a fresh water lake of 73 square miles to an entire marine, oceanic environment of many, many thousands of square miles is a stretch, but the point might still be valid at some level. Ice tends to form first in bays and near existing ice sheets. A wide open Arctic Ocean is going to introduce new operating parameters on to the system we're discussing here. Whatever these new parameters are, I wouldn't profess to know, but it does seem to me that open water, even at the poles, will be more resistant to freezing, than a simple rebuild of thickness and extent would be. One doesn't simply drop the temperature. There are mixing phenomena attached that are different from those of a pre-existing ice sheet. There's going to be a lot of interesting science to watch, that's for sure. The moment tha Arctic reaches its first ice-free moment, the equations will change. Water _with_a_piece_of_ice in it freezes easier than water_without_ice. Suppose August or September 2017 will be the first year when ice will dissapear, the lines for the other months will fall faster, so instead of an all-year-round ice-free Arctic in 2040 we could have one in 2030.
arcticio - I don't see how that reframing changes the situation - you're still inviting us to extrapolate by eye that loss % curve. I note in your diagrams that both the volumes of ice that melts respectively freezes increases slightly year by year. Will those trends change when the arctic is ice free in the summer? 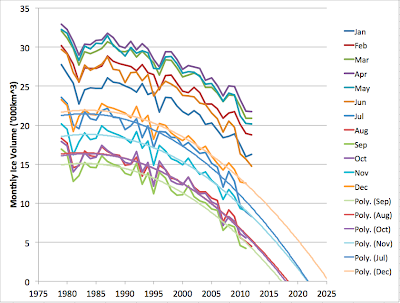 A similar graph, and the merits of various curve fits has been discussed on Neven's Arctic Sea Ice blog. Eric - thanks, I subscribed. The last ice is of course north of Greenland. After it is gone then the warm water will lap against the ice there and perhaps melt it quickly. A core of MYI surface for the annual rebuild is perhaps needed (the ice shelf off Greenland), otherwise here and there water refreezes in a thin film and is broken up again by waves. So perhaps Greenland and the Canadian archipelago all iced up work as supports for new ice buildup but as that ice on Greenland and the archipelago coast (below sea line? )also gets melted out then there would be no support for a new MYI ice pack buildup in winter. The dynamic could be changed for scientists towards analyzing the increasing speed of a Greenland breakup as there would be no base ice pack left just discontinuous floating "shoals" here and there causing random trouble for maritime traffic and tourism but no basis for inuit or polar bear hunts. I mean to say once the "icepack" is gone completely then perhaps it is gone forever. Lars - I don't understand your question, sorry. Thanks for the interesting posts. I will try to rephrase my question. I see in yours and especially in acticios´ diagrams that the volume (and area from Wikipedia) of ice that melts every year increases year by year. So does also the amount of ice that freezes. The latter is however as an average smaller than the former. At least when the arctic is free of ice in the summer, the amount of ice that melts every year will decrease. My question is- will that also be true for the area or volume that freezes or will that area stay fairly constant for a while? I take your answer on using volume of ice rather than area in your diagrams. I would be especially true for land ice such as Greenland. However when we come close to recreating all ice every year, I have a feeling it comes closer to a two-dimensional problem. Ice formation and ice drift from Russia to Greenland where it melts (compare Nansen and his boat Fram) are such phenomena, I guess. We have an exponential increase in solar energy absorption with the Arctic Ocean going on here. At the North Pole, we have exactly six months when the sun shines (spring equinox to autumn equinox). As the ice melts, the area with very low albedo increases (i.e., sea water). With the date that melting occurs moving to the left each year, the amount of solar energy absorbed by the sea accelerates. Now, we already know that the warming Arctic is reducing the temperature differential between the equator and the arctic. That differential is the driving force for Rossby Waves and the jet stream. We are observing ridges and troughs beginning to get "stuck" as the energy levels to drive the atmosphere decline. This is producing severe drought in places (Russia, Europe, Texas and now the MidWest) and severe storms in other places. The big question is whether or not this phenomenon could eventually result in a summertime atmospheric "hang" in which the Northern Hemisphere's weather system simply gets completely stuck for several months (or, even permanently)? The result would be catastrophic. I also tend to see things going that way too, but the answer to "The big question is whether or not this phenomenon could eventually result in a summertime atmospheric "hang"..." is probably "it's impossible to say". Given the complex nature of the climate predicament, I think it is critical to understand that there is too much uncertainty to predict the likelyhood of any particular future outcome. I always try to remind myself that particular outcomes aren't really worth focusing on too much - but the trends are becoming all too clear; change is a comin' fast and it isn't likely to be at all friendly to existing life on this planet. Because of all the uncertainty at play, I think there is a very strong argument to be made for incorporating resilience and robustness into every facet of our existence. Unfortunately, this argument is often about as well received as an argument for voluntarily reducing per capita energy use by orders of magnitude. People and businesses love their "harmful efficiencies" about as much as they love to consume energy. "People and businesses love their "harmful efficiencies" about as much as they love to consume energy." Which is why energy prices need to much higher, and skewed to favor the more sustainable ones. Unfortunately, our political culture prevents us from taking collective action to make prices better reflect real costs. We just rush headlong over a minefield in the faith that the market will 'handle it'. Divine Providence will ensure that we run out of fossil fuels 'just in time' to make the prices drive changes in behavior. Our individual capacity to learn varies widely enough that some among us can learn from large amounts of empirical data over vast ranges of geologic time and then anticipate future trends. Unfortunately, our *collective* ability to learn is limited by the motivated reasoning of politically powerful 'platinum citizens' and the people they propagandize. Lucas, "it's impossible to say" is not the answer I was looking for. But, of course, you're right for any particular year. However, on a long enough time scale with enough cycles, the probability approaches unity. The problem we have is that the owners of fossil fuels in the ground have a very big vested interest in preventing their assets from being devalued---thus, they control the government by investing in professional politicians who will do their bidding. What we need to be looking at are the risks of business as usual. When the Global Financial Crisis was just being born, no one among the ruling class would consider that there was a fatal flaw in the economic system. Similarly, no one in the ruling class now can imagine the risks we are running in heating our planet beyond a potential tipping point. Here's an example of a tipping point risk: the arctic goes increasingly ice-free at earlier and earlier dates. This increases the chance of a Greenland ice-melt on a massive scale (not a complete melt, but something very large). In one unlucky summer, we could have a massive ridge settling over Greenland, raising temperatures to levels which melt a sizeable amount of ice and raise sea level abruptly, inundating major cities. Every summer in which we simply watch the ice melt and do not take action raises the odds of a potential catastrophe happening. The odds continue to rise until our number will come up, given enough rolls of the climate dice. Do we simply wait and watch the trainwreck like we did with the GFC? Will scientific logic change the course of the ruling class? It certainly didn't prevent the GFC, which many economists were warning would happen. If we fail to prevent this climate catastrophe, we are rabbits, multiplying without bounds, and not the masters of our own fate. We may be forced in the end to destroy civilization in order to save the planet for us and the other species we share it with. "However, on a long enough time scale with enough cycles, the probability approaches unity." As the timescale is increased, the more it seems that we should anticipate that unforseen dynamics will cause climate change to proceed in unpredicatable ways. For instance, what starts as an apparant move toward the type of "atmospheric hang" you described earlier could very well end up being a passing state on the way to some other condition. I think you are right to suspect that the fossil fuel industry will make every effort to keep getting their "assets" to market. I'm not sure what surprised me more; that Rex Tillerson went on the record saying climate change is real, or the hubris implied by his statements. That policy makers are well informed of the risks, I have very smalle doubt. What policy makers do with that informaton... well, all we need to do is look at what is happening in politics and foreign policy today to find plausible answers. I think I have a slightly more pessimistic view of our options. That we appear to be witnessing a collapse of the arctic ice pack - as measured using empirical data - makes me wonder if a tipping point hasn't already been crossed. But by that time, we're stuck playing "catchup". It certainly isn't clear that if we allow oursleves to get behind the curve like that, that we will ever be able to get ahead of it again.